With almost every new distillery comes a new visitor centre. Owen Bellwood takes a look at the visitor experience to see how brands can bring people back time and time again. What steps can distilleries take to ensure visitors come back again and again? The spirits industry is going through a development boom at the moment, with seemingly no end of news about expansions and openings. In the last week alone, Elixir Distillers announced its intention to build a distillery on Islay, Bardstown Bourbon Co revealed plans for further expansion and Old Forester confirmed the opening date for its new Louisville distillery. In each of these announcements, pictures were painted of gleaming new stills, cavernous maturation warehouses and, of course, the all important visitor centre. With news from owner Diageo that it plans to invest a staggering £150 million into Scotch whisky tourism, including plans to open a new Johnnie Walker experience in Edinburgh, there’s no denying the fact that whisky tourism is now a massive industry in its own right. With an established brand like Johnnie Walker, the visitor centre will have a lot to cram in. There’s the history of the marque, varying production techniques, the maturation processes, blending and bottling all to consider, and each has to engage an audience that may be hearing about it for the first or 15th time. This is a challenge faced by both new and old distilleries alike – how do you make an experience that appeals to both the casual drinker and the hardened spirits enthusiast? Once you’ve ridden the educational barrel ride at the Scotch Whisky Experience, you may hop across the sea and enter Ireland, home of the Midleton Distillery and the Irish Distillers portfolio of brands. 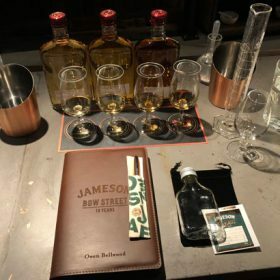 The distillery’s owner, Pernod Ricard, recently reopened Jameson’s historical Bow Street site as a fully immersive visitor experience, which I had the chance to visit this week as the brand launched its first cask strength expression. The site in the centre of Dublin, which was recently named the most visited whiskey attraction in the world, has taken its own approach to mass appeal. Jameson Bow Street provides an insight into the brand’s history and explains the production process in an innovative manner – which includes a chance to sniff the difference between pot still and column still new make spirit. While this background information is all very interesting, it’s the additional experiences on offer at Bow Street that I found most engaging. There’s a chance to gain a deeper understanding of each expression through an extended whiskey tasting, while visitors can draw spirit direct from a maturing cask and blend their own Jameson expression. There’s even a workshop dedicated to Irish whiskey cocktails – which, let’s be honest, is how many people are introduced to whiskey today. Although the site is no longer a working distillery, its design is well thought through and engages consumers in the history of the brand from the moment they step through the gates. If other distilleries hope to draw in the crowds, and keep them coming back, they need to offer more than just a taste, a wander round the still room and a video about floor malting.